I am slipping back through time several few weeks (or swiveling around, time being more spiral than linear in my experience) to share my love of ferns birthing themselves up-close; spied in the little fern gully behind our home, late April. I know Lori always did clickable pics, and I enjoyed that, yet I cannot choose. All of your photos from last week were so beautiful. I don't know how she did it? I expect the same will be true this week. Enjoy slowing down with your camera, paying full attention, observing beauty and curiosities many people pass right by. Your generosity of spirit and keen eyes may open the door to miniscule miracles and mirth others would not have access to otherwise. Feel free to include poetry, prose and thoughts your macro photo or series inspire(s) in you. Writing is completely optional for participation. Straight out of the camera (SOC), edited, color, black and white; anything goes as long as you bring the viewer near to whatever it is that attracted your heart and woke up delight. I love the monochrome shot, it looks liker a big question mark. I love how your blog is poodle protected! Too cute. I didn't know you had this meme, thanks for the invitation. Your macro shot are gorgeous. Sweet captures of the little ferns, amazing to see up close! Thanks for hosting and sharing the ferns unravelling. Do you eat the 'fiddleheads' as they do in parts of Canada? I've seen them in our grocery store but they don't appeal to me. 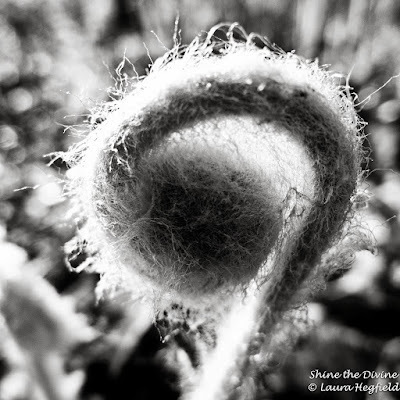 Fiddleheads are wonderful to watch, unfurling into ferns! I love to watch ferns unfurl. Lovely captures Laura. Thanks for hosting! Amazing photography. it looks like a green eggs covered with cobwebs. beautiful shot of a fern. Gorgeous shots of the ferns. They're like tentacles when they're unfurling. Great macro shots .... I also love the monochrome shot! Interesting variations of an interesting form. Love the light too. Great photos! I love your fern! And Í´ll share your link with my next Makros! Wishing you a lovely weekend, we are having a sunny Sunday here in the UK yay! Beautiful pics and such a deep haiku. I don't know what went wrong, when I selected the picture. I can only see a block/gray Square. I have tried to delete the post and re-link, but I can't find out how to delete it. If you can Laura, please delete it and I will re-link my post. What a beautiful series of images, Laura! Such a lovely macro of ferns. Enjoyed your haiku and your beautiful images. Glad also to see the progress report on your dog.....I'm always interested. I love ferns too. These seem to be sword fern--ah, makes me homesick for the forest. Glad things are good for you, dear Laura. ((hugs)) You are such a lovely lovely lady. Exquisite photos. I like the macro meme though I doubt I'll participate. Thanks for hosting it. All the photos are great. Glorious images of miraculous beauty! stunning macros of the ferns! Great work. Slow down, indeed! I just tried to enter a macro shot and the LInky said that it was accepted but it isn't showing and now it (the Linky) won't let me go in and re-add it. Sorry! These are amazing macros! The light is magic. Thanks for sharing this beauty. Great shots Laura! One can't imagine simple ferns can be gems through the lenses! It takes those talented to bring out the best in them! Nicely! This is a magical post! This should be featured in a magazine-glorious! Thank you Laura for sharing your view! Your photos are just incredible - you have captured each delicate detail with a most professional eye for the shot. Magic, Laura, pure magic!!! I love the exploration in birthed ferns! The white threads make me feel like they're ancient rather than brand new-like those babies that are born with old souls...LOVE your work! Thank you for shining and sharing!Hugs! Magical spiral walks from the fern family. Thank you. Laura I am also interested in the retreat. I have a question for you. Where should I email you? Love love the ferns and you did such a lovely job on these photos as always! so much visual beauty here i am swept away! Hey Laura! Thanks for visiting my blog last week! I do love macro photography and have some nice photos (or so I think). I will join the fun next week! Beautiful and highlights just how wonderful nature is. I love these Laura. Such beautiful shapes. Wow! these clicks are really awesome!! Thank you for sharing them with us!